The Parish Council meeting originally planned for Monday 1st April 2019 has been rescheduled to Monday 8th April 2019 at 19:30 in the Sports Pavillion. Notice is hereby given in accordance with Section 87(2) of the Local Government Act 1972 that casual vacancies have occurred in the office of Councillor for Long Crendon.This notice will expire on 19th December 2018. the Parish Council may, at their meeting on Monday 7 January 2019 fill the vacancies by co-option of suitably qualified persons. 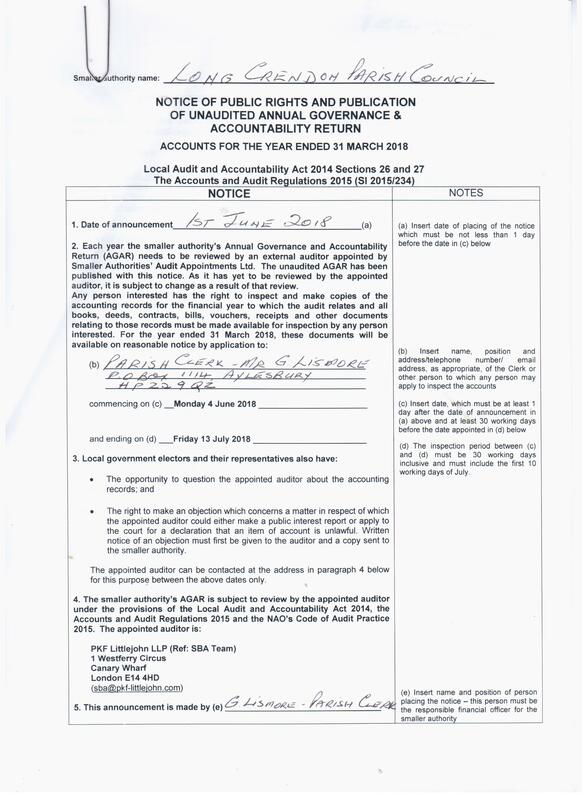 Issued by Gregory Lismore, Clerk to the Council, 30 November 2018. 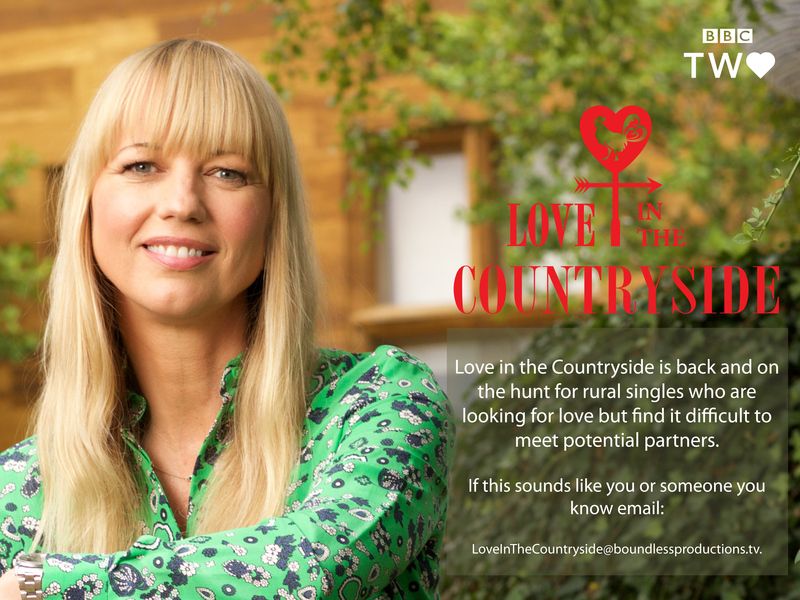 TV Producer Frankie Mensah at Boundless Productions is making a second series of the BBC Two show "Love in The Countryside" and looking for rural singles who are looking for love but find it difficult to meet potential partners. We have been requested to put the attached flyer on our webpage, then if any of our parish members are interested in getting in touch with they they would have their contact details. 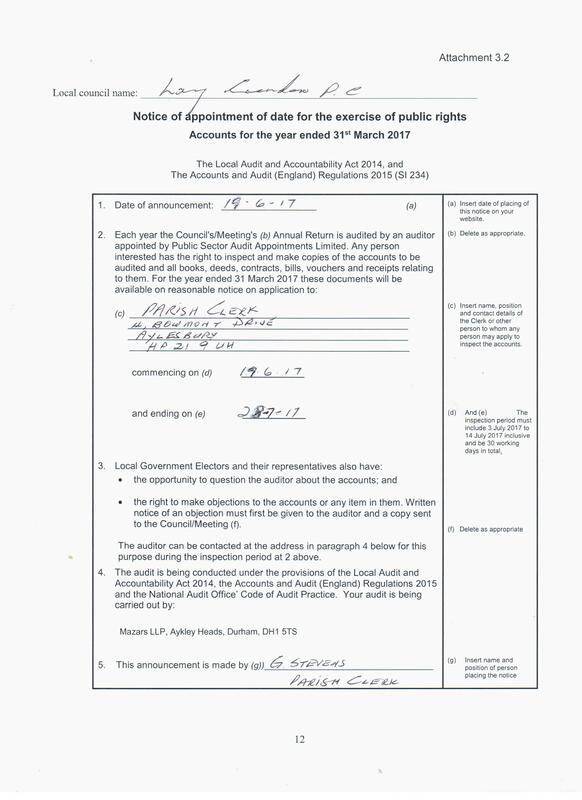 ELECTOR'S RIGHTS - Electors in the Parish of Long Crendon have the right to question the appointed auditor about the accounting records in respect of the accounts audited for the year ended March 2018. See the attached notice for relevant information. The Parish council have been informed that Rectory Homes Limited are commencing their building operations on their site at Wainwrights under planning permissions with reference 17/01488/ADP . For Public Highway issues (obstruction of the Queen's Highway) please contact the police (999 or 101 depending on urgency). If somebody has been injured please call 999 immediately and also seek medical assistance. Please refer to https://www.aylesburyvaledc.gov.uk/sites/default/files/page_downloads/ENF-how-to-make-a-complaint-DL.pdf for advice. Pavillion Car Park close Tuesday 24 April 2018 for lining. Please co-operate. The Long Crendon Pavillion Car Park is closed for Tuesday 24 April 2018 (from the evening before) to allow our contractors to complete white lining. Please do not move the temporary barriers. Signs have been in place for several days in the car park and on the adjacent notice board advertising the closure. Thank you. A recent burglary has been reported on Bicester Road, Long Crendon. Between Thursday (05/04/2018) and Wednesday (11/04/2018) someone broke into the house, whilst the occupants were away. They have used a ladder to get into a first floor rear bathroom window. The house has then been searched and jewellery and a gift card stolen. They appear to have left the premise by the patio doors. PC Michael Bellamy, based at Aylesbury Police Station, is investigating this crime. Please let him know if you noticed anything suspicious in the Bicester Road area between these dates. If you have any information please contact PC Bellamy on the 24 hour non-emergency number 101, quoting reference number 43180107520. If you don’t want to speak to the police or give your details you can call Crimestoppers anonymously on 0800 555 111, or report it online. Please take a moment to review your own security. Make sure garden tools are not left out, that could be used to force entry to your property. Also check that any ladders are locked and can’t be used to get into yours, or your neighbours premises. Please note that the scheduled Parish Council meeting for 8th January has been postponed until 15th January. The Council meeting will follow the planning meeting which starts at 6.30. 15th January in sports pavilion. See attached notice seeking councilors to join the Parish Council. These vacancies have occurred due to resignations. Consultation on Thame road Speed cushion. The Highways authority are having a consultation to propose relocating 1No Speed Cushion in the publicly maintained section of THAME ROAD, Long Crendon. Objections or comments to be submitted by mail or e mail before 3rd December. to help it decide planning applications in the neighbourhood area. The Council thanks and congratulates all those who came out to vote on the plan. Attached is the official referendum result from Mr Bill Ashton the Deputy Counting Officer showing 631 votes in favour and 48 votes not in favour. The Coucil wishes to express it's grateful thanks to the members of the Steering Group for their dedication and hard work on the creation of the Neighbourhood Plan. Join the choir for "SING IN THE VALE." The attached gives full information and contact details. The decision of the Inspector appointed by the Secretary of State For Communities and Local Government for land adjacent to 80 Chilton Road is attached for your information. The group require assistance for their fund raising program. See attached request for full details. The attached general information for voters document from A V D C is for the assistance of voters for the referendum to be held on Thursday 7th September 2017. The referendum will be held on 7th September. The notice below advises on ensuring you are registered to vote on the adoption of the Long Crendon Neighbourhood Plan. Please note the attached notice from the counting officer advising of registration procedure to ensure you can vote on 7th September on the question "adoption on the Long Crendon Neighbourhood Plan"
Long Crendon Parish Neighbourhood Plan for referendum on 7th September 2017. Attached is the final version (post examination) of the Neighbourhood Plan. The attached Plan will now go to referendum on 7th September for voters to consider. Attached is the final report from the Examiner's on the neighbourhood plan. It is submitted by "Intellegent Plans and Examinations"
Message from the Chairman on the progress and imminent referendum on the parish Neighbourhood Plan. Please read attached "Message from the Chairman"
Fund raising Circus event for the school. This will be an enjoyable family outing on 9th September. The full details are attached. Attached is an important document for all residents to note carefully. The circular gives advice to Campaigners and Parish Councillors on publicity, expenditure limits and Purdah. Both Campaigners or Groups and the Parish Council must comply on expenditure limitations, publicity restrictions and the PURDAH rules. The attached document covers the detailed explanations. for a fun filled family day out with your local Emergency Services and charities. The decision to allow dogs on the allotments has been challenged and a procedural error was indeed made in passing the decisions. Six months must elapse before a decision may be changed. 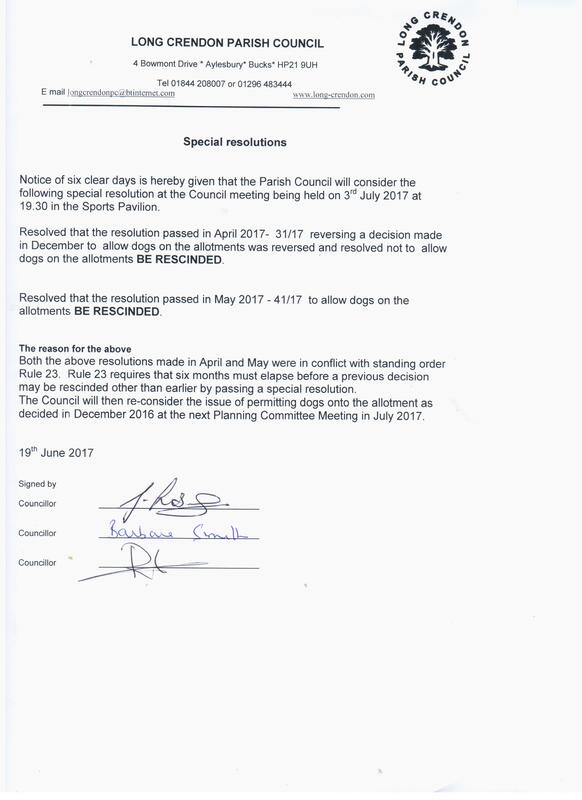 Attached is a resolution which will rectify the error and Councillors must pass it at our next Parish Council meeting on 3rd July. The reasons for this are shown at the bottom of the attached resolution. Attached is the official notice announcing the rights of the public/residents to view the accounts to be audited for year ended March 2017. The documents will be available from 19th June to 28th July 2017. Please note an informal meeting will be held at 6 PM on Monday 5th June to discuss the application for the 19 dwellings on the land off Wainwrights. The venue will be the Sports pavilion in Chearsley Road. Three Parish Councillors have recently resigned.The Council wishes to fill these vacancies as soon as possible. Please see the attached notice in respect of applications. The Councillors meet twice per month to address council and planning matters. 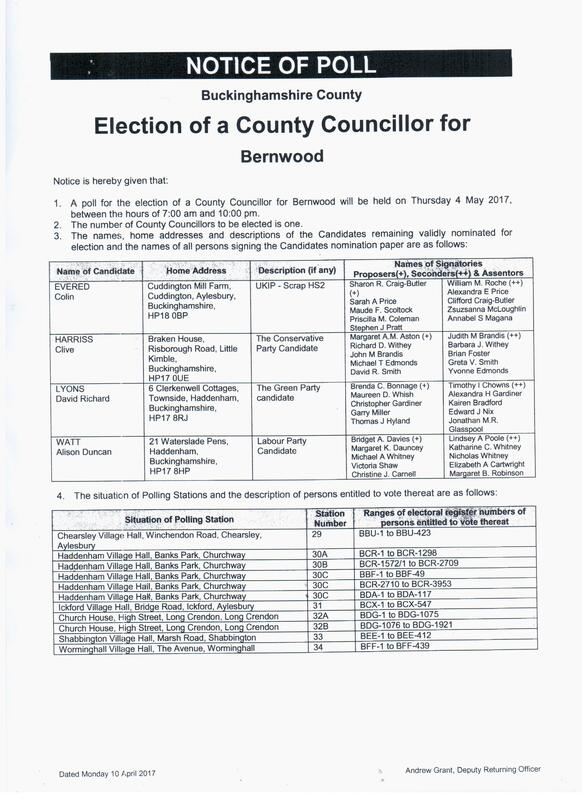 on Thursday 4th May for the Bernwood seat. See attached for list of candidates. The annual parish Meeting is a meeting where the Council covers what it has done in the year and what it plans for the future. residents are encouraged to attend and raise any issue concerning the village for discussion with Councillors. The Chairman presents a report for the year and comments on future activities. Attached is the agenda covering the usual items for discussion. Please try to attend and raise any issues that concern you. As the Parish Clerk will be retiring shortly we need to fill the post. Please see attached summarised advert giving the necessary details. The Long Crendon Parish Neighbourhood Plan has been submitted to A V D C for formal examination The plan will be examined over the next six weeks and then it will come back to the village for the referendum. Attached is the LONG CRENDON PARISH NEIGHBOURHOOD PLAN SUBMISSION FINAL Six of six documents informing the plan. Attached is the CONSULTATION STATEMENT. Five of six documents informing the plan. Attached is the STRATEGIC ENVIRONMENTAL ASSESSMENT(SEA) Report four of six documents informing the plan. Attached is the BASIC CONDITIONS STATEMENT. Report three of six documents informing the plan. Attached is the LOCAL GREEN SPACE AND LANDSCAPE STUDY REPORT. Report two of six documents informing the plan. Attached is the SITE ASSESSMENT REPORT. Report One of six documents informing the plan. Attached is the latest news on the plan for residents information dated 6th March 2017. The Parish Council are wishing to appoint A junior member to serve on the Council. Any Youth Between 16 and 18 who may be interested in joining the Council on an advisory/ training basis serving the community should apply. Please note the submission of the plan has been delayed from 20th January to the end of January.This is due to feedback from one of the statutory bodies being delayed and will now only be received on 20th January. Please note that the street lights in the village belong to the Parish Council. We are responsible for repairs and maintenance of the street lights and pay for the electricity consumption. Please contact the Parish Clerk on 01844-208007 0r e nail longcrendonpc@btinternet.com. I will add it to my list and have it repaired when we next call out the contractor to do repairs. Attached is the update on the plan as at 19th December 2016. As promised at the public meeting last night (2nd November)attached are the slides shown in the presentation of the Neighbourhood Plan. Thanks to those who attended and contributed to the plan. This is the culmination of well over a year's work in preparing the Neighbourhood Plan. Further to our notification to residents regarding the public meeting, on 2nd November, to present the above plan, we attached the plan for your information. Please do attend the session on 2nd November. IMPORTANT NOTICE FROM YOUR PARISH COUNCIL. Our draft Neighbourhood Plan is now complete. It will be presented to the village on Wednesday 2nd November at Long Crendon primary school, Chilton Road at 7.30pm. The pre submission plan is on this website for your information.